Based on latest data from CSO, Dublin has gained disproportionately in population compared to the rest of the country in 12 months through April 2015. 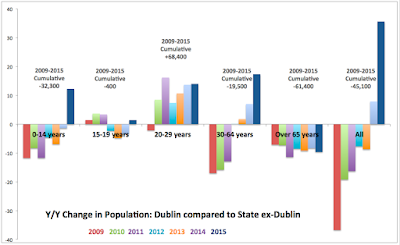 At the top level, Dublin population rose 30,700 in 2015 compared to overall state population rise of 25,800, which implies that ex-Dublin, the country lost population at the rate of 4,900. 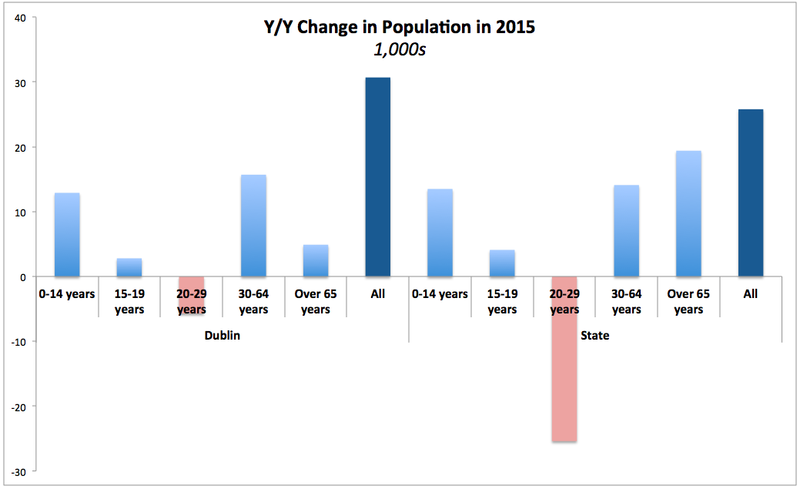 Dublin v rest of the state population changes were even more dramatic when one considers age distribution. 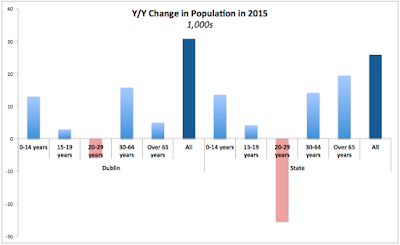 Population aged 0-19 years rose in Dublin by 15,700 in 2015. The same group numbers increased state-wide by 19,600. Which means ex-Dublin, younger population rose only 3,900 against Dublin's 15,700. This highlights family formation dynamics in Dublin as opposed to the rest of the country. Younger working-age population (age 20-29) fell in Dublin by 5,700 in 2015. Across the country, the decline was 25,400. Which means that ex-Dublin, younger working-age population has declined by 19,700. The main cohort of working-age population (30-64 years old) has risen in Dublin by 15,700 in 2015 compared to 2014. Across the country the increase was 14,100, which implies that ex-Dublin, the state lost 1,600 adults in the main working age cohort. Older population dynamics were also in favour of Dublin. In 12 months through April 2015, population aged 65 and older rose in Dublin by 4,900 and it was up nationwide by 25,800. Which means that ex-Dublin, older age population rose 20,900. Dublin population, as % of state-wide population of core home ownership demographic that transacts on the purchasing side of the market (30-64 year olds) has been rising overall since falling to 27.5% in 2010 and is currently standing at 28.9%, still below 29.6% high in 1996. But the rental demographic of 20-29 year olds has shown different dynamics, reaching period trough in 2013 (at 32.3%) and rising since then to 33.1% in 2015, a level consistent with 2011. Neither suggests huge uplift in demand for rentals or owner-occupied homes. Of course, these are cohorts of 2015. Back in 2007, when house loans were last available in plentiful supply, large share of purchasers demographic today was… err… renters. And absent credit for house purchases, as this demographic moved into purchasing age, they stayed renters. This would suggest increased pressures on rents. But the picture is more messed up by the losses of population share in 20-29 years old group, most likely due to emigration. Longer tenure for children staying in parents' homes also should have held rents back. In other words, our traditional view of demographic distribution of buyers v renters has been messed up by the sheer duration of the current crisis. Take 2010-2015 period. Over that time, Dublin population of 20-29 year olds fell 61,000 and across the rest of the country, this cohort numbers fell 123,000. 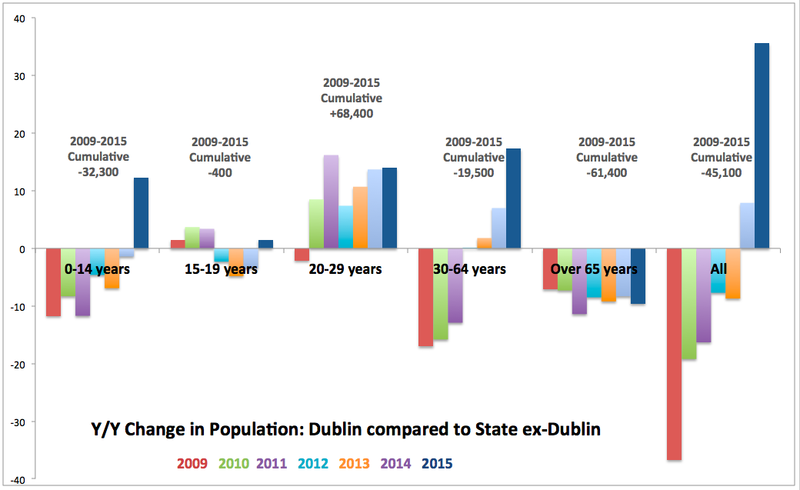 But cohort of 30-64 year olds rose in Dublin by 60,900 against a rise of 47,600 in the rest of the country. Demand based on demographics, therefore, suggests swing from renting toward purchasing. Similar picture repeats if we take 2011-2015 cumulative changes and 2012-2015 and 2013-2015. And, still, rents were rising. What is more mysterious is that overall working age population has been relatively mildly altered in recent years. In Dublin, working age cohort (20-64 year olds) has grown by just 10,000 in 2014-2015 period and it is up only 8,000 on 2012. The cohort is still down 13,300 on 2008. Across the country, ex-Dublin, things were much worse: since 2008 the cohort fell 62,200 and compared to 2014 it is now down 21,300. In simple terms, unless children and retirees are buying homes, there shouldn't be any dramatic uplifts in demand for property in Dublin, and most certainly outside Dublin. Which goes to say that any claims about actual demand (based on numbers of potential renters and buyers) are a bit strained. In 2008, there were 821,200 people of age 20-64 living in Dublin. Today there are 807,900. Unemployment rose over that time too. So where is that tremendous growth in demand coming from to push property prices up? Property prices in Dublin hit a period trough in 2012. Since then, there has been a net increase of just 8,000 in 20-64 year olds cohort living in Dublin. Again, where is that spiking in demand coming from? In my view, simple demographics do not explain Irish property prices uptick from crisis lows. Speculation and latent surplus of savings in a relatively small category of Irish residents (and ex-past), plus re-distribution within cohorts between renters and buyers are the main drivers on demand side of the equation. Supply side also contributes significantly to prices uptick. And beyond that, there has to be significant behavioural component: our addiction to property - despite all the hopes of Dublin 'planners' for an Amsterdam on the Liffey - has not gone away over the years of the crisis. The first, initial shock to the economy has had an effect of scaring us put of the markets for property. Negative equity contributed more downward momentum. But once we learned to live with our fears, we simply decided o turn back to our old model of family investment: bricks and mortar.